Various work on Jasmine… Healed septum, second lobes and a healing left side of the nose. The additional work here is a scaffold and right side of the nose to double up. Pierced over a course of time @ Shiva. Thank you for the continued trust, in doing what I do. This entry was posted in Nose Piercings, Piercing Portfolio, Scaffold Piercings, Septum Piercings and tagged Body Jewellery, Body Modification, Body Mods, Body Piercer, Body Piercing, Double Nose Piercings, Double Piercings, El Capitan, Fresh, Greenwich, Healed, Industrial Piercing, Industrial Piercings, London, London Body Piercing, London Piercer, London Piercing, London Town, Nose, Nose Piercing, Nose Piercings, Pierced, Pierced Girls, Pierced Grrls, Pierced People, Piercing Photography, Piercing Portfolio, Scaffold, Scaffold Piercing, Scaffold Piercings, SE10, Septum, Septum Piercing, Septum Piercings, Shiva, Shiva Piercing Studio, Shiva Piercings, South East, South East Livin', South East London, South East Natives, South London, South London Piercer, South London Piercing, South London's Finest, Titanium, UK, UK Body Piercing, UK Piercer, UK Piercing, Various, Various Piercings, Various Work. Bookmark the permalink. Anna’s healed double nose piercings, pierced I believe three months apart and fully healed inside six/seven months. Both pierced w/titanium curved j-claw bar/studs. Love it when customers and clients heal super quick – as generally speaking I say three months is fast, six months more common and twelve months if you have problems/slow healing. These look awesome alongside a 6mm segment ring fitted in Anna’s septum (not pierced by me) and a continued thank you to the many lovely people who trust in me when adding to their piercing collection. This entry was posted in Nose Piercings, Piercing Portfolio and tagged Body Modification, Body Mods, Body Piercer, Body Piercing, Double Nose Piercing, Double Nose Piercings, Double Pierced Nose, Double Piercings, El Capitan, Greenwich, Healed, Healed Double Nose Piercings, Healed Nose Piercings, London, London Body Piercing, London Piercer, London Piercing, London Town, Nose, Nose Piercing, Nose Piercings, Pierced Nose, Piercing, Piercing Photography, Piercing Portfolio, Piercings, SE10, Shiva Piercings, South East, South East London, South London, South London Piercer, South London Piercing, Symetrical Nose Piercings, Symetrical Piercings, Titanium, U.K., UK, UK Body Piercing, UK Piercer, UK Piercing. Bookmark the permalink. Elliot’s healed nose piercing several months later refitted w/1.2mm x 8mm segment ring. This entry was posted in Nose Piercings, Piercing Portfolio and tagged Body Jewellery, Body Modification, Body Mods, Body Piercer, Body Piercing, El Capitan, Greenwich, Healed Piercings, London, London Body Piercing, London Piercer, London Piercing, Nose Piercing, Nose Piercings, Nose Ring, Piercing Portfolio, SE10, Segment Ring, Shiva Piercings, South East, South East London, South London Piercing, UK Body Piercing, UK Piercer, UK Piercing. Bookmark the permalink. 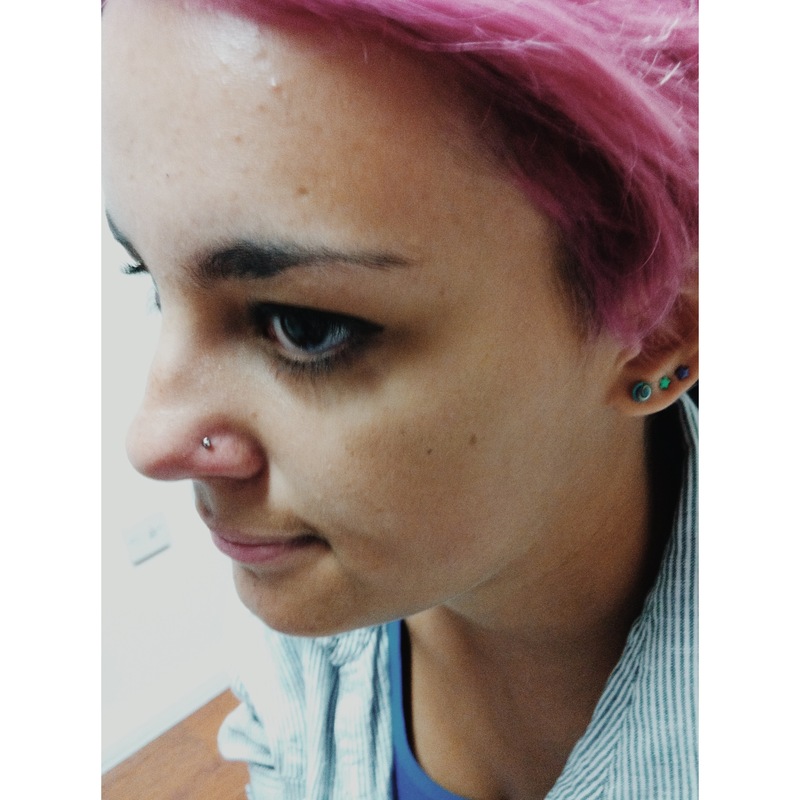 Isabella’s nose piercing w/titanium nose stud by El Capitan @ Shiva Piercings. This entry was posted in Nose Piercings, Piercing Portfolio and tagged Body Mods, Body Piercer, Body Piercing, El Capitan, Greenwich, London, London Body Piercing, London Piercer, London Piercing, Nose Piercing, Nose Piercings, Piercing Portfolio, SE10, Shiva Piercings, Titanium, UK Body Piercing, UK Piercer, UK Piercing. Bookmark the permalink. Have pierced the lovely Tosin a few times over the years and here’s some great shots of her healed double nose piercings refitted w/0.8mm gold and black contrasting rings. It’s a continued pleasure to meet and pierce so many wonderful people, all with their own story to tell… I feel blessed, to hear so many of them. This entry was posted in Nose Piercings, Piercing Portfolio and tagged Black & Gold, Black Steel, Body Mods, Body Piercer, Body Piercing, Double Nose Piercings, Double Piercings, El Capitan, Gold Steel, Greenwich, Healed Double Nose Piercings, Healed Nose Piercings, London, London Body Piercing, London Piercer, London Piercing, Nose, Nose Piercing, Nose Piercings, Piercing, Piercing Portfolio, Piercings, Royal Borough of Greenwich, SE10, Seamless Rings, Shiva, Shiva Heads, Shiva Piercings, South East, South East London, South London Piercing, South London's Finest, UK Body Piercing, UK Piercer, UK Piercing. Bookmark the permalink. …and Sian’s mum, the wonderful Kathy’s fresh nose piercing w/one of the beautiful new opal stones in at Shiva. These are available in multiple colours and Kathy chose my favourite, the blue with flecks of green; that kinda reminds me of the globe we live on. It’s always an absolute pleasure and an honour to meet and pierce so many wonderful, kind and caring individuals who make doing what I do an extremely enjoyable experience and process for both myself and my customers and clients. This entry was posted in Nose Piercings, Piercing Portfolio and tagged Body Mods, Body Piercer, Body Piercing, El Capitan, Greenwich, London, London Body Piercing, London Piercer, London Piercing, London Town, Mama Knows, Nose Piercing, Nose Piercings, Pierced Nose, Piercing Portfolio, SE10, Shiva Piercings, South East, South East London, UK Body Piercing, UK Piercer, UK Piercing. Bookmark the permalink. Holly’s well healed nose pierced by me and refitted w/0.8mm x 6mm seamless steel ring. I’d only ever recommend shrinking down to a ring this snug when fully healed. This entry was posted in Nose Piercings, Piercing Portfolio and tagged Body Mods, Body Piercer, Body Piercing, Diddy Ring, El Capitan, Greenwich, Healed Piercings, London, Nose Piercing, Nose Piercings, Piercing Portfolio, Ring Switch, SE10, Shiva Piercings, Small Nose Ring, Small Nose Ring Piercing, Snug Fit Nose Ring, Steel Ring. Bookmark the permalink. Nose piercing w/titanium ball stud and Kate’s a good commercial for directions hair dye! This entry was posted in Nose Piercings, Piercing Portfolio and tagged El Capitan, Greenwich, London, Nose Piercing, Piercing Portfolio, SE10, Shiva, Shiva Piercings. Bookmark the permalink.